Parenting OC Magazine "A Spectrum of Possibilities"
SUMMER REGISTRATION OPENS MAY 1st! CLICK HERE TO BE NOTIFIED WHEN REGISTRATION OPENS! SPACE IS LIMITED!!! 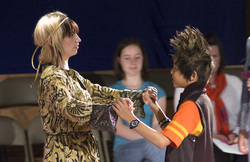 2012 - Dr. Paltin has expanded her socialization program for children and teens with spectrum disorder conditions to a weekly Theater Arts based therapeutic program. This exciting program incorporates use of theatre arts, music and movement to engage participants in developing social skills and social awareness. Participants gain confidence, social skills and the ability to express themselves creatively in a supportive and dynamic environment. Space is limited in Groups. Registration for SUMMER 2016 COMING SOON! complete the contact form and submit. To Submit Payment via credit card on-line complete the following and submit. Bringing together my passions for theatre music and the arts with therapeutic experiences for those who might not other wise have an opportunity to explore these aspects of themselves is a wonderful experience. I invite you to e-mail or call to find out more about igniting the talents within your child or adolescent as we develop life skills and self awareness in this unique and innovative approach.